Home resales slipped 4 percent in May, falling below the 5,000,000-unit mark on a seasonally-adjusted, annualized basis for the first time since February. 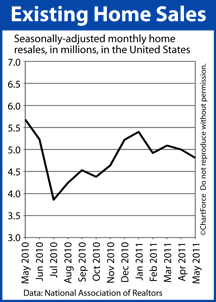 April’s resales were revised lower, too. Analysts were surprised by the figures because it runs counter to the National Association of REALTORS® monthly Pending Home Sales reports. The association’s Pending Home Sales Index is purported to be a forward-looking indicator for the housing market because 80% of homes under contract close within 60 days and recent Pending Home Sales readings show an increase in “pending” homes. This month’s Existing Home Sales, however, fell flat. May’s drop in home resales wasn’t limited to a particular region or price point, either. All 4 geographic regions lag last May’s results. Five of the 6 valuation ranges fell, too. The Existing Home Sales report wasn’t all bad, however. Although the months of housing stock rose to 9.3 in May, the number of homes for sale nationwide fell 1%. This suggests that there weren’t as many buyers in May as compared to April — a function of weather, jobs and the economy. Since April, the jobs market and the economy have shown steady, slow improvement and Mother Nature has been less destructive. Home resales should rebound in June and July, therefore. If you’re a buyer in today’s market, home supplies are higher and mortgage rates are lower. The combination makes for ample bargain-hunting. There’s excellent “deals” to be found in Brentwood. Ask your real estate agent for help in finding them.